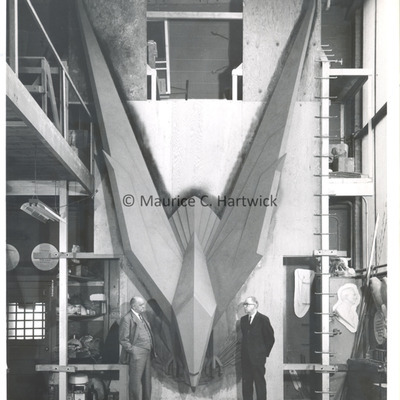 Full-scale plasteline model for "American Eagle (Victory Eagle)" in Marshall M. Fredericks' Royal Oak, Michigan studio. The completed sculpture is located at the John Weld Peck Federal Building in Cincinnati, Ohio. 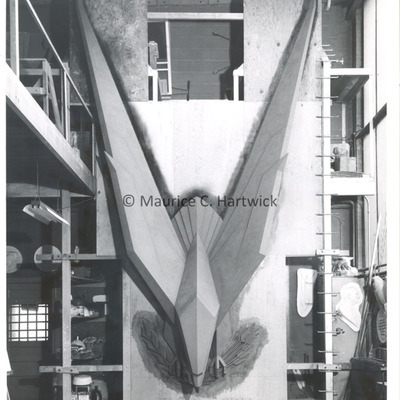 Full-scale plasteline model for "American Eagle (Victory Eagle)" in Marshall M. Fredericks' Royal Oak, Michigan studio. Located on both sides of the model are two unidentified men. The completed sculpture is located at the John Weld Peck Federal Building in Cincinnati, Ohio. 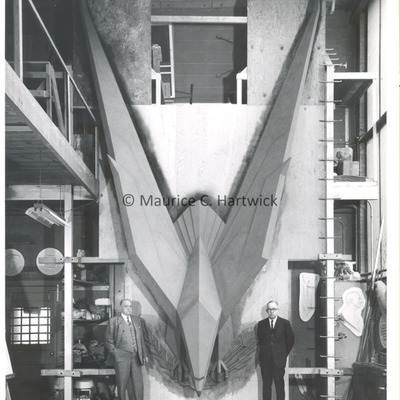 Plasteline full-size model of "American Eagle (Victory Eagle)" in Marshall M. Fredericks' Royal Oak, Michigan studio. Located on either side of the model are two unidentified men. The completed sculpture is located at the John Weld Peck Federal Building in Cincinnati, Ohio.